I am a big fan of what Homestead did. The sense I had of Salem 66 was that they were a big part of their local scene. I think a bandmember or relative of one of the bandmembers ran a booking agency near Boston. They did have a few really good songs. First, thanks for posting this. The more attention you can give to a band that for some could become one of their all-time favorites the better. 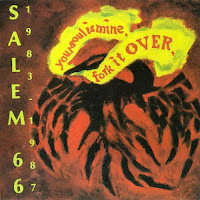 Salem 66 DID indeed get a lot of press in the Boston area, often focused on their being an "all-girl" band (later they added at a female singer). At the time their intense image put me off a little and my guess is that if I had heard them back then, I probably would not have cared much for it ("too weird"). Fast forward to about five years when clued in by a book -- pretty sure it was "Lost In The Grooves" -- I searched the Internet and found the "Across The Sea" 45 somewhere (maybe the Little Hits blog). I was stunned. There was something relentless and disturbing and seemingly deep about this song that kept me listening to it over and over. A year or so later some real tragedy landed on my family, and I adapted the song to fit that situation (key lyric the singer's unconvincing proclamation that "I'm not afraid of living on my own now." Here in the Boston area I have been able to pick up a few of their LP's on vinyl. Nothing as great as that for me, but all of it interesting. I never could find this out of print compilation. Is it true that the two singers have never released another recording since the end of Salem 66? Check it out folks, this could be your new favorite cult band. I concur, and certainly relate with the notion of adapting songs as changes in life arise. Unfortuntately changes and variations in my life usually take a turn for the worse - all the better to have good music to fall back on. Salem 66 had a certain mystique to them. I really don't know what anyone in the band went onto afterwards. Somehow when I had meant to type "later they added a male guitar player" ended up the inexplicable "later they added at a female singer"?! I wasn't drunk. Just overexcited. any chance of a re-up? my brain just remembered how much I loved that 1st ep. Thanks! I am the first Male guitar player to break the All-Female ranks of Salem 66.In interviews we were always asked "whats it like to be in an all girl band?" To which i'd answer "I'm a guy.Do I need to pull down my pants to prove it?" Eventually I stopped doing interviews because of that foolish question.I'm the only member of the band who continued and continues to play music. The link has been updated (again). Really like the tune I found ('Lemon Rind') and can't wait to hear more. [I'm partial to female vocals]. Thanks for the introduction/discovery. First heard this band on an overnight CBC Radio program called 'Brave New Waves' back in the late 80s. Tremendous share... Thank you. It's odd that "Lucky Penny" is missing from this retrospective, since it's probably the only track of theirs that got significant non-local airplay. The video for it made the rounds on MTV's "120 Minutes", so it's probably the one release that put them on the radars of most people who've ever heard of them and aren't from Massachusetts. Please re-up! Saw them live a few times way back when - brings back fond memories!